Warm Up America! staff first met Barbara Gruener, a counselor and character coach at Westwood Elementary in Friendswood, TX, a suburb of Houston, when she wrote to us about the Westwood Knitting Club's involvement in Warm Up America! Later we worked with Barbara and her enthusiastic club members when they got involved in the joint Save the Children/Warm Up America! Caps to the Capital Campaign. Westwood students saved hundreds of newborn baby's lives by knitting and crocheting preemie caps. Below excerpts from conversations with Barbara, as well as an article she wrote for Teaching K-8, a professional development magazine for teachers, called "A Need to Knit," which explains more about her Westwood Warm Up America! club in greater detail. She outlines how her club began with a class of 20 third graders and has grown to more than 100 students in grades 3, 4 and 5. In a recent conversation, Barbara pointed out that elementary students do not generally have clubs to participate in so they really look forward to the knitting club meetings. Initially, she sent invitations to all third graders and interest in the club grew by word of mouth. Students must be enthusiastic because they meet at 7:10 a.m., before classes start! As club membership increased, she expanded to two early morning classes, which generally meet once a week from October to December and February to April. And it's no longer just a "knitting" club. 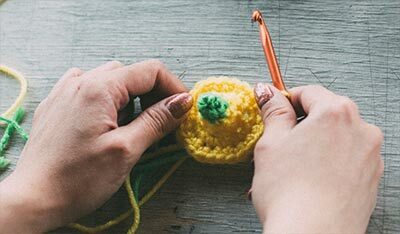 Students can learn crochet too. To her delight the club has many boy members, as well as girls, and it has evolved into an intergenerational program, involving older adults as well as several parents. The cost of the program is minimal. She asks students to bring their own needles (size 10, short) and a Ziploc bag to carry their knitting. The school secures donations of worsted weight yarn from the community. She also has wonderful support from a local yarn shop. The owner assists by casting on and knitting several rows on the student's needles. Barbara has found it extremely helpful to teach the basics of making a stitch before teaching how to cast on. This past year Barbara tried something new. 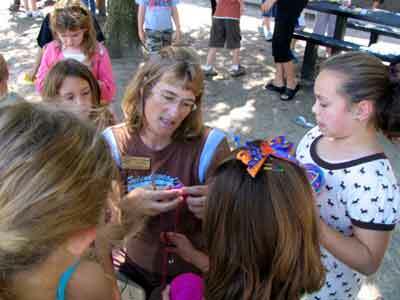 She explains, "We cast on 10-12 stitches and taught the children to make bookmarks before the patches. We found that with fewer stitches initially, the little knitters learned more quickly and were able to see a product through to completion before tackling a 7" by 9" patch. We received 40 bookmarks by November and took them to the elderly. It really was rewarding to visit and be able to leave them with a touchstone and memento of our visit." Barbara is also on hand at recess to help untangle knots and get kids who are struggling back on track. Right after the club started last fall, she came up with an idea, which we love. Barbara hosted a "Knit In" at the local library to give kids a chance to come on a Saturday for tutorials if they were having trouble catching on. What is so gratifying to her is that the students are giving back to their community and enjoying learning skill that will last a lifetime. After the students complete their Warm Up America! sections, they have gone on to make many other projects for themselves and as gifts. 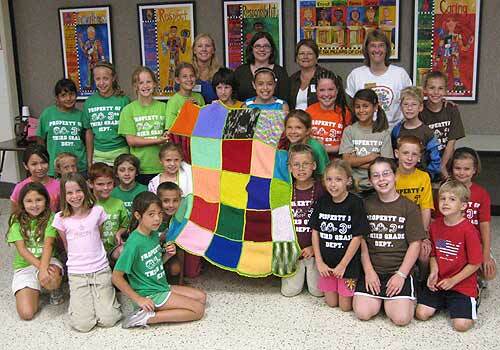 Westwood's Knitting Club has received lots of media attention because of their good works. In the August 2008 issue of Highlights, the largest paid circulation children's magazine in the world, there is a story about the club's involvement in Caps to the Capital. It doesn't look like your average third-grade extracurricular activity. There are no chess moves to make, no paints or easels to use and no moving gears to maneuver. And the balls these students are playing with aren't what you'd think of as typical sports equipment. These students have balls of colorful, worsted-weight yarn, a pair of size 10 (short) knitting needles or a size H crochet hook and a 7" x 9" pattern cut from cardstock - all of which can be neatly stored in a plastic bag they carry in their backpacks. So, what exactly are these kids doing? A wonderful hobby. Meet the members of Warm Up, America! - Westwood Elementary's knitting and crochet club. The idea for this group unraveled three years ago when one of our third graders received a knitting kit as a birthday gift. Her mom told me about what a wonderful hobby knitting had become for her daughter. She went on to ask if we could teach this skill to other kids her daughter's age. She was persuasive in her request because she talked about how this craft worked to help develop fine motor skills, how it forced a child to use both sides of his or her brain and how it even involved some math. She added that once the students required less assistance, we could even read to them from our character education literature while they knit. Sold! Our first afghan. We decided our goal would be to build character by teaching students to knit for service and create afghans to be donated to a person in need. The idea to make patchwork blankets was found at www.warmupamerica.org. Our group met once a week before school to put needles to yarn and create the 7" x 9" patches that would later be bound together by a parent volunteer. Between sessions, the students were encouraged to knit a few rows. That first spring we collected enough patches to make one patriotic red, white and blue afghan. We donated it with pride to The Center for Pregnancy in Friendswood and it went to an excited expectant mother. Have yarn; will travel. By the second year, our membership had doubled and some 50 children were attending our weekly meetings to learn how to knit. They were an enthusiastic group who became quite passionate about knitting and could be seen everywhere with their yarn and needles in tow. Students would often give up their recess time in order to knit. They could also be found knitting during read-aloud time in class. A student was spotted at the local video store over spring break adding stitches to his patch as his family picked out a movie. One of the girls hosted a sleepover party where she and her guests knitted while they watched movies in bed. That year we made enough patches for three beautiful throws, two of which we donated to outside agencies and one that we were able to auction off at our annual school fundraiser. The afghan sold for an amazing $220.00! Mentor knitters. What began as a springtime activity in our school library with 20 club members has snowballed into a year-round venture that is now 100 members strong. 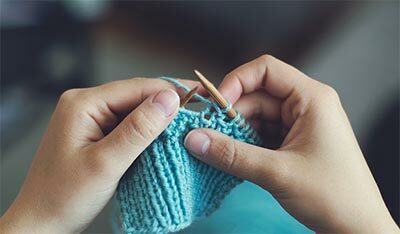 We started our third year of knitting this past October with a cafeteria full of eager brand-new knitters alongside many seasoned needle-workers who were ready to lend a hand. As our club grew, so did our need for volunteers. Two of our volunteers are retired community members and others are grandparents of club members, making it a great intergenerational activity. We also have some moms and a few Westwood faculty members helping us out. Our newest volunteers are former knitting club members who are now fourth and fifth graders at our sister school next door. When they're not busy helping the younger students, our mentor knitters are working on little hats to donate to local hospitals. Our volunteers also help our students with the bind-off. They're on hand to help fix mistakes and ready to help unknot unruly fibers. Yarn donations. For the most part, our supply of worsted-weight yard is donated to the school. We also have local resale shops that put yarn donations aside for us. In addition, some children who prefer a certain color choose to bring their own yarn. Last year we had a few students who sold handmade items and donated the money so that we could purchase yarn in bright, new colors to add to our collection. Many hands. We have already donated three afghans this year. Our students shared their handiwork with the residents of a local nursing home before presenting the two throws to the King and Queen of their Valentine's Day dance. The third throw was donated to The Center for Pregnancy. With so many hands working so diligently, we're hoping to double our donation to six blankets this year. This service project recently earned us a Promising Practice Citation from the Character Education Partnership. It was an honor to accept the award on behalf of our students, who have learned to perfect this lifelong craft and use it to help others.